George Whitfield Jr. is well aware of the pressure that comes with his latest endeavor. 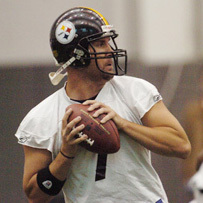 But Whitfield looks at working with Steelers quarterback Ben Roethlisberger as the professional opportunity of a lifetime. Whitfield, 32, trains quarterbacks for a living — he is the owner of Whitfield Athletix in San Diego — and he first worked with Roethlisberger right after the 2009 season in Southern California. “We did talk to (Roethlisberger) about being out in Southern California, but he said right away: ‘I don’t want to go anywhere. I want to be right here in the city of Pittsburgh, near my teammates,’ ” Whitfield said. You can read the entire article/interview with Mr. Whitfield here.